In recent years, disruptive technologies have triggered digital transformation across every major industry. In manufacturing, they've actually started a revolution. According to CNBC, the Fourth Industrial Revolution, or Industry 4.0, was a major theme at the January World Economic Forum meeting in Switzerland. Experts agreed that this revolution largely consists of technology merging with human lives, a change that will shape major manufacturing trends for 2019 and beyond. Manufacturing trends for 2019 — such as 5G capability, cobots, and D2C modeling — are set to revolutionize the industry this year. The First Industrial Revolution was about mechanization, the Second was marked by mass production, and the Third was all about digitization. Industry 4.0 is all about integration — blending the physical and digital worlds for more efficient and intelligent operations. With this revolution sweeping through, industry leaders can look forward to these five manufacturing trends for 2019. Manufacturing has long required two types of technology: information technology (IT) that powers the back office and operational technology (OT) that powers production on the factory floor. While IT has gotten smarter and smarter, OT has mostly relied on human programming to perform specific tasks. That's changing quickly, thanks to advances in connectivity, data analytics, and IoT sensors. Microsoft predicts that IT/OT convergence will be one of the key manufacturing technology trends this year. Along with investing in smarter, data-optimized machines, manufacturers are retrofitting legacy machines with sensors that enable the "dumb" machines to collect data in real-time and communicate with "smart" machines and intelligent business systems. This allows for more agile, efficient production and provides managers with a dashboard view of everything that's happening throughout the organization. Merging IT and OT allows for greater automation and productivity. The next logical step is bringing humans into the loop by integrating IT and OT with CT — communications technology. With a sophisticated unified communications-as-a-service (UCaaS) platform, manufacturers can automatically route notifications from the machines to the appropriate human. For example, if a machine breaks down or if there's a supply chain delay, the people who need that information receive an automatic SMS alerting them to the situation. In this way, IT, OT, and CT work together to provide the best possible communications workflows. For the manufacturing industry, keeping up with digital transformation is everything. Here's how cloud solutions can help. Long awaited and much anticipated, 5G connectivity could be available to some manufacturers by the end of this year. This emergent technology promises vastly greater download speeds, latency reduction, and the ability to control far more devices and power smarter AI tools. This will be a game-changer for manufacturers looking to take greater advantage of IoT and robotics, and many IT trends in manufacturing for 2019 will revolve around preparing for the rollout. It will also be a game-changer for enterprise communications internally, with suppliers and vendors, and with customers. By providing users with reliable high-speed internet from anywhere, 5G will make UCaaS solutions more powerful (and more valuable) than ever. With smart machines providing better data and 5G soon providing greater connectivity, manufacturers are looking for ways to identify and prevent problems before they arise — on the production floor and all along the supply chain. For example, predictive maintenance technologies could reduce manufacturers' maintenance costs and unplanned outages. Meanwhile, control tower communications software lets manufacturers collect valuable data from mobile devices along the supply chain — answering questions such as, "where is my truck right now?" to "when will it arrive?" to "is there a more efficient way to get it here next time?" With some preparation and the right communications infrastructure in place, manufacturing leaders can capitalize on the changes Industry 4.0 will bring. To command larger profit margins, some manufacturers are shifting their business models to sell directly to consumers via e-commerce sites or subscription services. Even companies that aren't selling direct-to-consumer (D2C) are putting a greater focus on understanding the customer journey and the end-user experience. While this shift opens up new opportunities, it also creates new challenges. Rather than selling exclusively to business buyers — who know how to fill out purchase orders, still have access to fax machines, and understand supply chains well enough to sympathize with delays — manufacturers are now trying to engage smartphone-wielding, channel-hopping, impatient consumers who expect the same personalized, seamless experience they might get from online marketplaces. That's a whole new game that requires different communication tools. 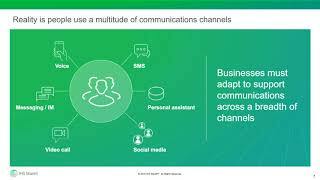 Communications platform-as-a-service (CPaaS) is a cloud-based framework that lets manufacturers synchronize real-time voice, video, and text-based communication. Using developer-friendly APIs, businesses can add these features to their websites, mobile apps, and social channels, allowing customers to reach out directly from whichever channel they prefer. This also enables manufacturers to collect all the data from customer interactions and integrate it with other key business systems. Worldwide spending on robotics and drones could top $115 billion this year, up 17.6 percent from 2018, according to IDC. Much of this spending will be driven by manufacturing industry trends, including high demand for collaborative robots, or cobots. Built with sophisticated AI and machine learning capabilities, cobots take on the dangerous, strenuous, and repetitive tasks, while alerting human workers to potential hazards and machine malfunctions. Despite concerns that robots will replace human labor, cobots are meant to augment workforces. The technology has actually created new jobs, to the point that the manufacturing industry could be faced with 2.4 million available positions by 2028. Implementing these next-gen robots will mean training entire teams of production workers and every new hire on how to work with the machines. A robust UCaaS platform can help manufacturers provide consistent, ongoing training across teams and locations by enabling live video training from any location. Each training session can then be recorded and stored for future reference, and included with new hire onboarding materials. With some preparation and the right communications infrastructure in place, manufacturing leaders can capitalize on the changes Industry 4.0 will bring, using the blend of human capability and digital automation to stand out in a competitive landscape.